A guy driving a 2003 BMW X5 rode nearly 50 miles on Monday at speeds over 100 mph after he claimed his gas pedal got stuck, at which point he told police, who went to quite some lengths to stop him. Before you even ask, the answer is no. Not a lot of this story makes sense. We’ve got questions. The BMW got through two sets of spike sticks, before being felled by a third one laid out by an officer. The episode took place on Interstate 95 in Indian River County, Florida, just north of West Palm Beach. The driver was identified as 28-year-old Joseph Cooper, who was not injured. The full details of the incident are unclear, though police did first urge Cooper to put the BMW in neutral, which is the proper course of action when your throttle is stuck. Cooper told dispatchers that he could not put the BMW into neutral, for reasons that are also not quite clear. Dispatchers told him to put the car in neutral, try the emergency brake and even try adjusting cruise control. Cooper didn’t want to talk with CBS12. He said he was shaken up by the whole incident. Nor was it clear why Cooper’s brakes did not work, either, as brakes are usually more than powerful enough to stop—or at the very least slow—a car under wide open throttle. 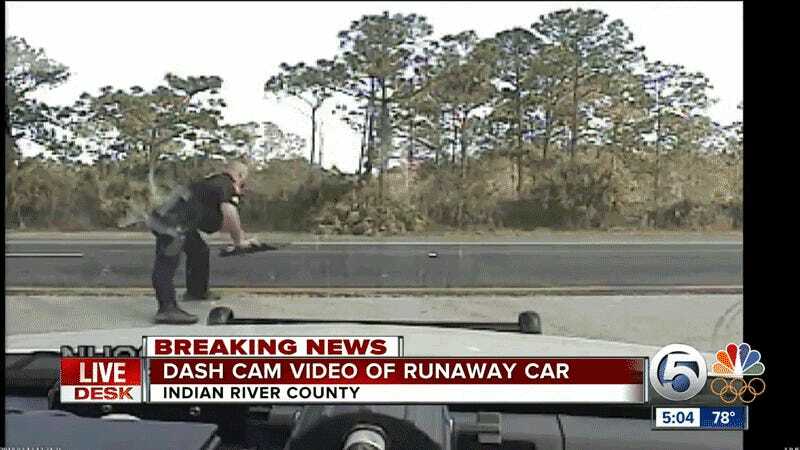 Based on the reports we have seen, the scenario described is implausible to BMW and we would be happy to work with the Florida State Police to investigate the cause of this incident. BMW drivers have long been able to rely on integrated safety systems that help ensure safe operation of every BMW vehicle. All BMW vehicles, including the 2003 X5 described in this incident, employ an electronic accelerator pedal which uses software logic to override the accelerator whenever the brake pedal is pressed while driving. This fail-safe software means that if the vehicle detects that both pedals are depressed, the on-board electronics will reduce engine power so that the driver may stop safely. The vehicle could also have been stopped by two additional means: By placing the transmission in neutral and coasting to a stop and/or by shutting off the ignition without removing the key. This is accomplished by turning the key counterclockwise. The engine would have shut off and the driver could have safely coasted the vehicle to a stop.